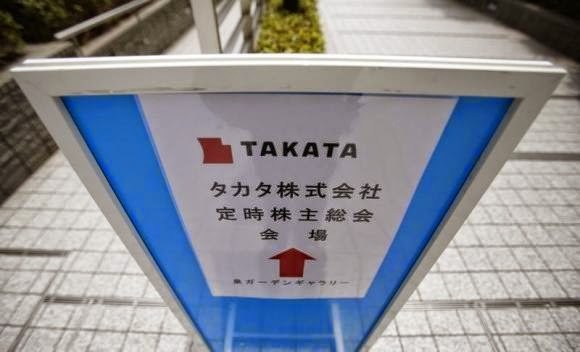 U.S. auto safety regulators on Thursday ordered Japanese supplier Takata Corp (7312.T) to provide documents and answer questions under oath related to the government's ongoing probe of potentially defective Takata air bags in millions of U.S. vehicles. The National Highway Traffic Safety Administration sent a special order to the supplier's American unit, TK Holdings Inc, ordering delivery of the documents by Dec. 1. Takata spokesman Alby Berman said on Thursday the company "is cooperating fully with NHTSA and is working to meet their requests." For the past 18 months, Takata has been besieged by chronic, widespread problems with defective inflators in its air bags, which can explode with excessive force and spray metal shards into vehicle occupants. Since 2008, 10 global vehicle manufacturers that use Takata air bags have recalled more than 10 million cars in the United States and more than 17 million worldwide to replace inflators that have been linked to at least four deaths and numerous serious injuries. In June, NHTSA launched its probe of whether Takata air bag inflators made from 2000 to 2007 were properly sealed or subject to other defects. It also asked the automakers to recall air bags in certain regions, such as Florida and Puerto Rico, where the parts were exposed to higher moisture and humidity that could cause deterioration of the explosive material inside. Critics have said Takata and NHTSA have not moved fast enough on the issue. On Thursday, lawyers for U.S. consumers asked a federal judge in Miami to speed up a class action against Takata and four automakers, saying public safety was at stake. U.S. District Judge James Lawrence King scheduled a Dec. 8 hearing on whether Takata and the automakers should turn over internal company documents to the consumers’ lawyers. One safety advocate criticized NHTSA for moving so slowly on issuing the special order, saying such moves typically occur within 30 days of the launch of an investigation. “The big question is why didn’t they send it sooner?” said Clarence Ditlow, executive director of the Center for Auto Safety, which has been pushing for NHTSA to broaden the regional recalls to a national campaign. “You cannot get to the bottom of this defect unless you have the facts, and to delay five months in sending out that letter is inexcusable,” he added. NHTSA Deputy Director David Friedman said the safety agency was forcing Takata to supply the documents and answer questions under oath as part the agency's probe. "We expect Takata's full cooperation as we work to keep the American public safe," he said in a statement. NHTSA officials, including Friedman, were due to meet with Takata executives later on Thursday. In the special order signed by Chief Counsel Kevin Vincent, NHTSA ordered Takata to produce documents relating to communication between the Japanese company and its rivals, as well as its customers, related to ruptured air bags. NHTSA also asked the supplier for any documents related to manufacturing issues connected with problems in production of air-bag inflators, including documents cited in an Oct. 17 Reuters article about manufacturing problems at the Japanese company's Mexico inflator plant. The safety agency specifically asked for any documents cited by Reuters, including a March 2011 email from then-supervisor Guillermo Apud titled "Defectos y defectos y defectos!!!!" In the email, Apud, who has since been promoted to engineering manager at Takata's Monclova, Mexico, plant and previously declined to comment to Reuters, said, "A part that is not welded = one life less, which shows we are not fulfilling the mission." He also described in one instance finding chewing gum in an inflator. NHTSA also asked Takata for a list of every death or injury, lawsuit or claim relating to ruptured air bags. Takata also was ordered to provide details on its inflator production capacity to replace millions of potentially defective parts already recalled, as well as its ability to expand manufacturing capacity to meet the recall needs. NHTSA asked Takata whether other inflator makers can build replacement parts to speed the recall process. TRW Automotive (TRW.N) Chief Executive John Plant said Tuesday his company had been contacted by Takata about helping with the recalls, but had not seen any extra business as a result. Autoliv (ALV.N) CEO Jan Carlson said last week his company had picked up business due to Takata's struggles.